Candy Flores, Arlington Food Services prepares turkey and cheese sandwiches in the kitchen at Washington-Lee High School in Arlington, Virginia, on Wednesday, October 25, 2011. The National School Lunch Program is a federally assisted meal program administered by the United States Department of Agriculture, Food and Nutrition Service operating in public, nonprofit private schools and residential child care institutions. 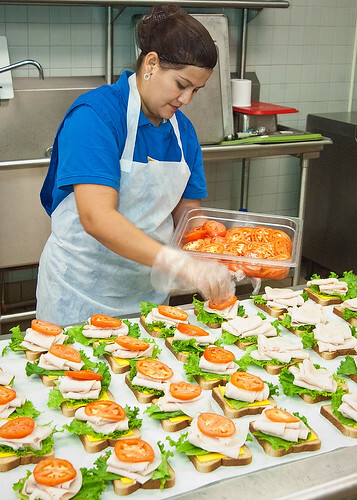 It provides nutritionally balanced, low-cost or free lunches to children each school day. USDA Photo by Bob Nichols.